RANCH, ACREAGE, WALKOUT BASEMENT, 4 BEDROOMS, 3 FULL BATHS, 3 CAR GARAGE!! 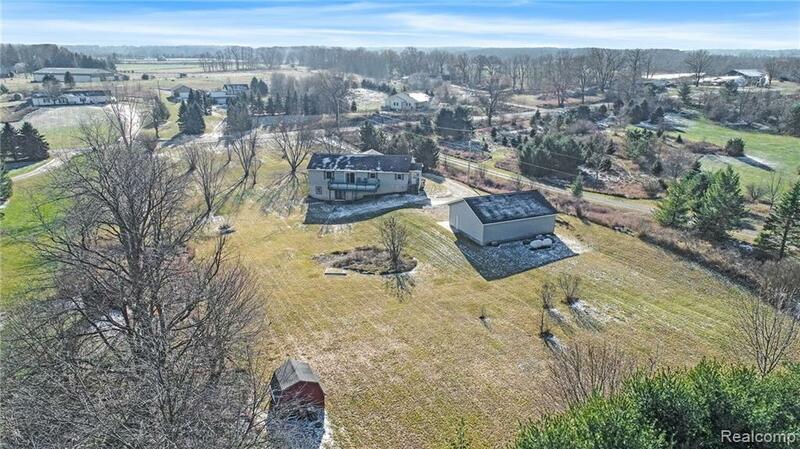 This custom built home boasts a serene country setting in an ideal location for easy commutes, just 1.5 miles to I-94. Everything you are looking for in your next home. Escape the city and enjoy this Pure Michigan destination within the 21000 acre Waterloo Recreation Area offering lakes, camping, fishing, hiking & snowmobile trails and so much more! Desirable open concept floor plan with spacious kitchen, dining and living areas. Large hotel style Master Suite with separate vanity area and garden tub. First Floor Laundry; Oversize 3 car garage built in 2011 w/newer concrete floors and 10' walls, 100 amp electric panel and plenty room for all your hobbies. Well maintained home includes newer appliances, 98% efficient 2-stage Furnace & Tankless Water Heater in 2016, newer pressure tank and water softener. Dedicated secure mudroom; covered porch, large balcony off dining area to enjoy the views. C2DAY! IDX provided courtesy of Realcomp II Ltd., via Ameritrust Realty Corporation and Realcomp, ©2019 Realcomp II Ltd. Shareholders.